New World Notes (aka Hamlet, Wagner, et al or vice versa) has run a couple articles this week about the SpotON3D grid in recent past. The first one I took notice of was about the Open sim plugin for this Second Life application. 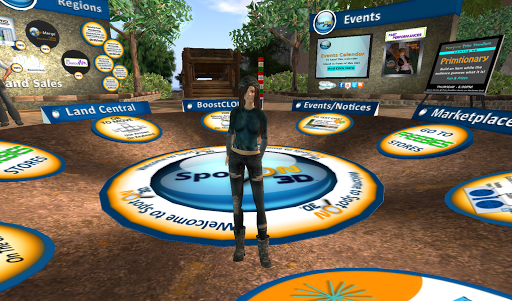 Today’s post, Big Breakthrough: You Can Run Second Life in Facebook with SpotON3D’s Browser Plugin Wrapper! really got my attention though. I think these are worthwhile reads if you used FB. For me, I was motivated to join. And I was able to get my SL name too! So, if you have a name you’d like to keep for yourself, this is worth joining if for no other reason than to deny imposters. Yeah, that’s me, Yordie Sands, at the main landing zone. As soon as I landed I decided not to begin an exploration, but rather, I chose to work on my avie’s shape for about 15 minutes. I know I don’t look like the Yordie you’ve always known, but I haven’t gotten serious about my avie’s look yet. I’ll need a great skin, great hair, gorgeous brown eyes and an identical shape as the girl you know. Here’s the thing, so far everything I’ve fiddled with in SpotON3D is very familiar to those who love SL’s Viewer 1. I’ll be trying out the FB ap soon, then trying it in SL itself. So, there you go… one of my new directions. This entry was posted in Journal and tagged Exploring. Bookmark the permalink.